BRUTAL treatment... Australian troops released from Changi prison. Christopher Bantick writes on why the TV series on Changi is sick. WHEN I was a boy I would sometimes be woken in the early hours by a tock, tock, tock. When I asked my parents what the noise was my father looked grave and said that, "Mr Ross", the neighbour over the back fence, "had been in Changi". Sometimes Mr Ross would chop wood all night. I never received a further explanation. Years later ­ after I had read history at the University of Melbourne under the guidance of the late and much lamented Lloyd Robson ­ I understood what caused Mr Ross to chop wood alone in the darkness. It made sense. Mr Ross was trying to exorcise his demons. When I became a history teacher and for a time headed the history department at Melbourne's Trinity Grammar, I wrestled with how to make history not only appealing but maintain integrity with historical fact. I was fortunate as I had two military historians in my department who were not only gifted teachers but knew their stuff. The same cannot be said for the producers of the much heralded ABC television series, Changi. There would be no way I would show this series to my students if I was still a history teacher. Moreover, I would advise my department not to give it air time. Changi, the television movie, is a farce. It will do nothing for the much needed development of a secure and well researched sense of Australian history desperately needed in schools. "What I am interested in is getting not so much the truth of what happened but the truth of the spirit of those who were there." "It does run the risk of satisfying the few and antagonising the many because a documentary style wasn't an option. It was impossible to have skeletal actors with ulcers that were eating through to the bone." It may have escaped the ABC mandarins, hungry for a programming hit, that the national broadcaster has an educative responsibility to get the facts right. It is likely that young viewers will accept the ABC version of Changi as fact. Who will correct this? Who will tell the truth? When the Japanese entered World War II on December 8, 1941 with the bombing of Pearl Harbor, it took just three months for 22,000 Australians to become prisoners of war. At the end of the war, in August 1945, 14,315 servicemen and 37 service women had survived. One in three POWs under the Japanese had died. Nearly half the deaths suffered by Australians in the war in the Pacific were among the men and women who had surrendered. Changi was part of this. As much as Changi is not ­ by Doyle's own admission ­ an accurate reflection of the POW experience, the series raises deeper and more serious questions about the nature of history and how history is sold. It is a curious thing that the ABC had just concluded the series, 1915, based on Roger McDonald's book of the same name, the week before Changi began. One can be forgiven for thinking that history for the ABC, like its big sister, the BBC is a winner. But slickly marketed, uncritical, imaginative, fictive history does nothing to advance historical awareness for the greater majority who know no history except the ABC and lavender-scented National Trust ersatz versions. Then there is the importance of the sacredness of memory. To attempt to make a series of Changi with people who were not there is insulting, discourteous and a travesty of history. The series of six programs is a long way from representing fairly or in a balanced way what went on in the notorious camp and is close to being a profligate waste of public money. Doyle's bleating that he couldn't make a documentary is exactly why the series deserves to bomb. What Changi, the real thing, was about was human suffering of an unspeakable kind. 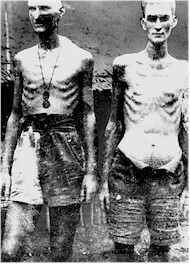 All Australians need to know what happened inside the Japanese POW camps and see the results. Changi is no myth. Its noble skeletons are part of the national story. What today's children are so often getting ­ and Changi repeats this ­ is a well-fed and well-scrubbed appropriation of history to suit the sensitivities of television audiences. Changi is entertainment made out of suffering, death and deprivation. There is something sick about sitting at home on a Sunday night and watching a soap called Changi while outside, Mr Ross chops wood.